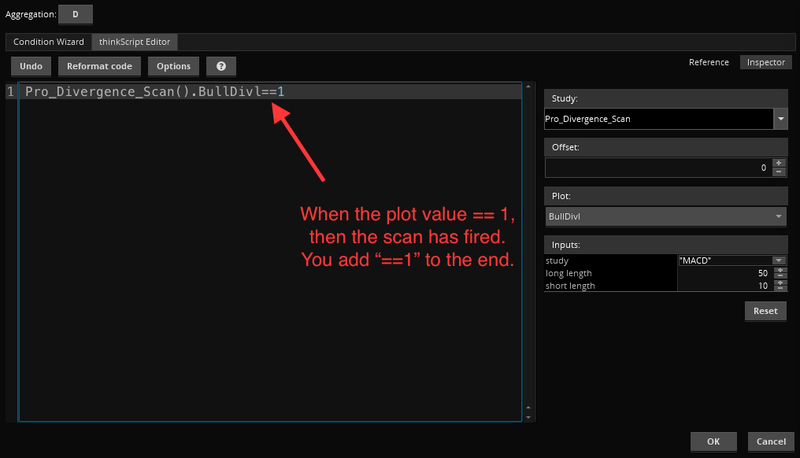 Instructions: Import Pro_Divergence_Scan like any other study, then follow these directions to set up a scan with it. After this, click “Ok” and run your scan. You may get a pop-up that warns that future changes to the study will not be reflected in this filter. That just means that if you change the code in the Pro_Divergence_Scan, it won’t be reflected here. 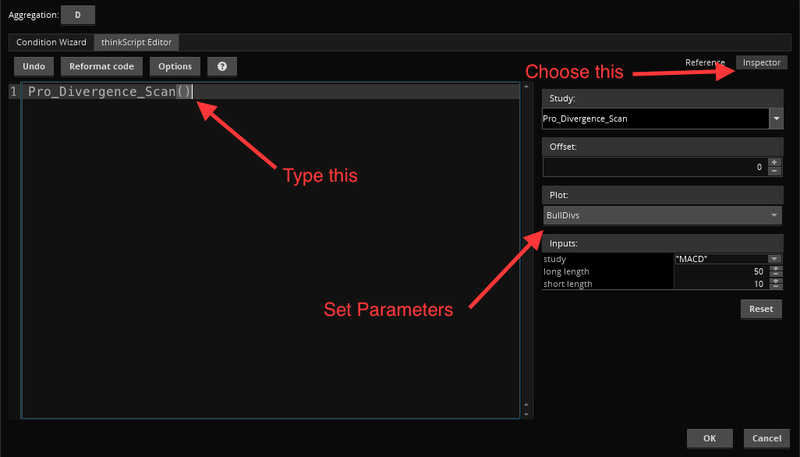 The filter takes a snapshot of the code when you make the filter. If you update the indicator, just delete the old filter and set it up again as above. This entry was posted on September 13, 2016 at 7:33 pm and is filed under Thinkscript. You can follow any responses to this entry through the RSS 2.0 feed. You can leave a response, or trackback from your own site. I have a question. I am pretty new to this, but am really technical so I can easily understand. After reading Dr. Elder’s book, I left with the impression that these divergences are not extremely common. However, in the study, they come up all over the place. Also, when I run the scan, it looks like every stock in the market comes up when I run it. I guess this makes sense since when using the study, there are arrows all over the place. What I am getting at is every chart I open has divergences, and the scan brings up every stock on the market. Am I doing something wrong? Thanks in advance! What inputs are you using? 22, 11 on study, and 50, 2 on scan. I have tried several combos on scan too. Using daily for both. Thanks! I saved 4 new and separate studies, one for each plot as above. When running this scan against 9278 stocks, I get 1914 hits. I’m not sure this makes sense; shouldn’t I be using any additional filters? 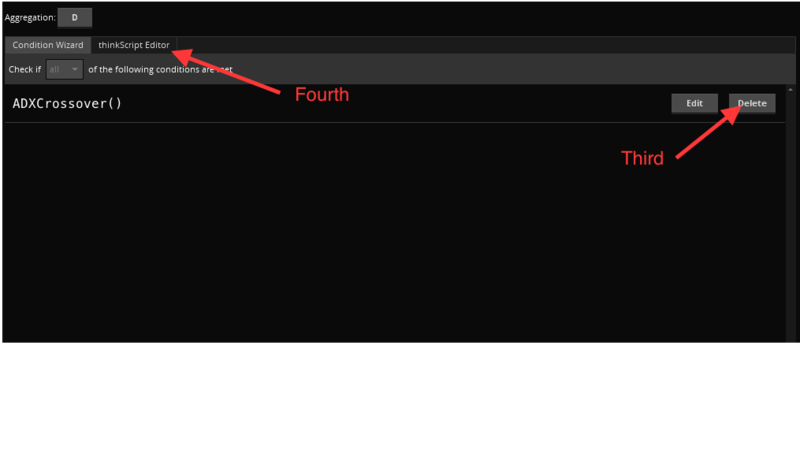 Also, what headers/columns should be customize in my list? Plus, when I add the study Pro_Divergence_Scan(RSI, 50, 10) to a 6 month chart of RUT, all I see are tiny candles. For the entire 6 months, the floating box shows mostly n/a although there is the occasional period where 1 or more of the 4 plots = 1 rather than n/a, Regardless, they’re hard to differentiate on the chart. Any comments/help would be greatly appreciated. You blog is awesome. I am very new to TOS. I am using Pro_Divergence_Scan with MACD (12,26) for short & MACD (50,10) for long. What are the parameter values should I use for BearishLong BearishShort, BullishLong & BullishShort ? Your suggestion is appreciated! Those parameters are outputs from the scan. You set the scan to check for when the value is equal to 1. You check for the type of divergence you’re interested in. So if you want to find bullish short-term divergences, you check for BullDivs == 1.